Coconut oil adds a twist of flavor to many popular foods such as sauteed veggies, baked goods and seared meats. Coconut oil, as well as other tropical oils like palm kernel oil, contains lauric acid, which is a good kind of fatty acid. Lauric acid can be particularly beneficial for your health. However, coconut oil is also high in saturated fat, so you might want to add coconut oil sparingly to recipes. Not all coconut oil is created equal. Refined coconut oil is made from coconuts that are baked before the oil is extracted. The oil is then bleached to remove bacteria and dust. Some refined oil also contains partially-hydrogenated fat which contributes to heart disease. Unrefined coconut oil is extracted from fresh coconuts and is not bleached. It is also called "pure" or "virgin." This type of oil maintains more of its anti-inflammatory and antioxidant qualities, making it a healthier option for your diet. All the calories in coconut oil come from fat. Although that sounds intimidating, you're supposed to have some fat in your diet. Fat absorbs vitamins, protects your organs, creates several hormones and keeps your bodily temperature within a normal range. One tablespoon of coconut oil has about 13.5 grams of total fat. Because each gram of fat has 9 calories, you'll get around 120 calories from a tablespoon of coconut oil. Because fat is required to perform numerous functions in your body, as much as 20 to 35 percent of your calories need to come from fat, states the Dietary Guidelines for Americans 2015. To give you an idea, if you have 2,000 calories daily on average, you can have 400 to 700 calories from fat. Divide by 9 to convert to grams, if it's easier for you to track fat grams. In this case, your daily fat allowance amounts to 44 to 78 grams of total fat. So if you add a tablespoon of coconut oil to your stir-fry dish, that tablespoon of coconut oil takes up 17 to 31 percent of your total fat allowance for the entire day, based on 2,000 calories. Saturated fat has a poor reputation, because it can elevate your cholesterol levels and increase your risk of heart disease. Because it can be detrimental, the Dietary Guidelines for Americans 2015 points out that no more than 10 percent of your calories should come from saturated fat. That's 200 calories from saturated fat, or 22 grams, for a 2,000-calorie diet. About 11.8 grams of the total fat in 1 tablespoon of coconut oil, or almost 90 percent, are saturated. About half of all the saturated fat in coconut oil is lauric acid. This substance has a different chemical makeup than other types of saturated fat and can improve your cholesterol levels by raising your good, high-density lipoprotein, or HDL cholesterol, explains Dr. Walter C. Willett from the Department of Nutrition at Harvard School of Public Health. Use coconut oil sparingly however, because it is still high in fat and calories. 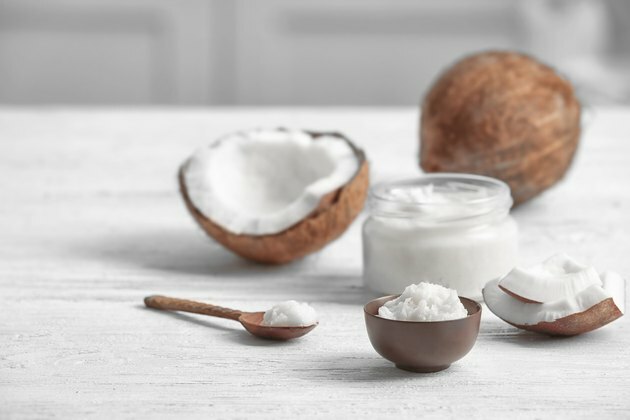 Coconut oil nutrition isn't particularly rich in any micronutrients, although it does have trace amounts of a few. The only mineral you'll get from coconut oil is iron, which is a nutrient that helps with oxygen transportation. Coconut oil contains a miniscule amount of vitamin K, which is a vitamin that helps your blood to clot. You'll even get a little vitamin E, which is an antioxidant vitamin that nixes damaging free radicals and shields all cells.